Backstamps are a fascinating part of collecting tea cups. It has taken me a while to figure out how these labels are read and how to research them. And I still make mistakes! lol! I look for the manufacturer's history on the Internet. and then applied to the bottom of the piece. I have only personally seen Incised, Impressed, Printed and Painted. I have never seen an Applied Molded Mark. Today's cup is a pretty vintage one. but what we don't see, is a backstamp that shows the manufacturers name! There are a few backstamps without names, but they use a consistent symbol to identify their wares. it is very hard to look her up. So why would the company's name not be on the cup??? but as I feared, no information was found. It is possible that this cup was mass marketed cheaply and therefore not designated. Lol...like a No Name or Generic brand! ooooh, maybe some chai tea? Saturday is the very first day of fall 2012!!! I have a basket full of fresh Macintosh Apples that smell divine! That's a unique teacup, Terri. Thank you for hosting this wonderful linky party! Besides, I have a few cups with only the word generic "GENUINE BONE CHINA ENGLISH", no number ... Another snag! Although I have spent the Encyclopedia pages looking for some image enlightening, and still pitch dark! This kind of information is always very useful for tea cup collectors. It's the part that interests me most, the origin of the pieces, maker, period, in short, social history! And your tea cup this week is beautiful to announce the Fall season. As to the lack of maker's mark, I think that sometimes, when they were part of a set, only the serving pieces - teapot,sugar bowl, creamer - would bear a mark. Terri, thanks for this information which makes for a very interesting tea cup and post. In Australia, we celebrate the start of our seasons on the 1st of the month. None-the-less, Spring Equinox is still a special event. Happy Fall Day to you. 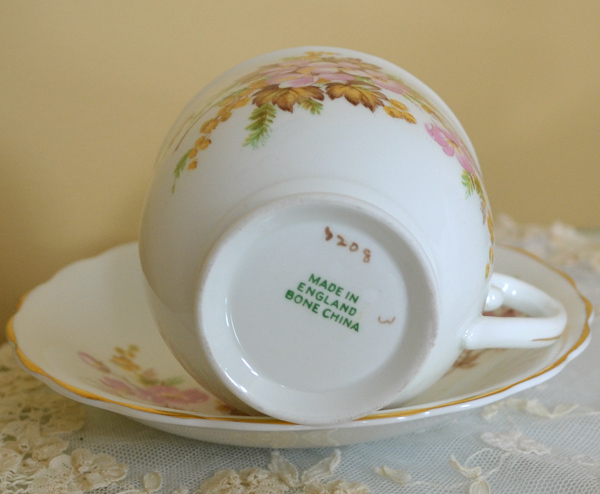 the origin of some unmarked china is a hidden secret. Always interesting to search on it and if successful, a real fun. I think there are some possibilities why this cup is not marked. I don't think its mass production. Then they wouldn't paint the gold rim by hand and add a painters mark. So maybe the cup was made in order of a sale company from an well known producer, who did not want to be named. Many other explanations are possible as well. Anyway, the tea cup is pretty designed and lovely for a tea in this season. Thank you for sharing, for all the interesting informations and for hosting this interesting event. P.S. : I hope, Martha is well. Thanks for hosting,and thanks for this interesting post, I'm just learning about backstamps. I have some pretty teacups just because I like the design factor, I mostly drink coffee! I am trying to acquire the tea taste! Thanks for this valuable information...I'll have to look at mine, it is very interesting! Pretty little teacup, Terri. Love the fall leaves. Thanks for the backstamp lesson. Happy Tea Day and thank you for hosting! Thanks for that info, Terri. I felt an immediate need to turn over all my teacups and have a look! Love seeing your marvelous teacup selection every Tuesday! That is a pretty little teacup. I always check the stamp but I don't have your encyclopedia. I have to rely upon the 'Net for my info. I'm thankful to have that, and most of the time, I can find what I'm looking for. Your post was very informative today. Thanks for sharing and enjoy your day. Love your teacup and thank you for all the information! I've always bought my teacups for the pretty look they have and now I find I have another hobby finding the history of the cups. Looking forward to your next post! Thanks for hosting this week! Hi Terri. It is a pain sometimes! Often, they just had the generic backstamps because they were made by a small potter, made for another business or more frequently, the plain names were used on seconds china. The number isn't always the pattern...sometimes it's a gilder or decorators number, and sometimes a mold number. Depends on the individual pottery. It certainly can be confusing!!! Thanks for hosting. Have a great day! I just remembered that today was tea cup tuesday, and I thought I'd link up my crochet tea cup from yesterday's post. What a beautiful teacup! Thanks for sharing all your interesting info! Have a wonderful week. I look forward to your posts on tea cup marks. Very pretty teacup Terri! Thank you for all of the info. I always look up for this info on the web. Sometimes I get an answer. Thanks for hosting! She is just as sweet as can be anyways! Thank you for stopping by my blog, leaving a kind comment and becoming my follower...I greatly appreciate it :) I am now your newest follower. 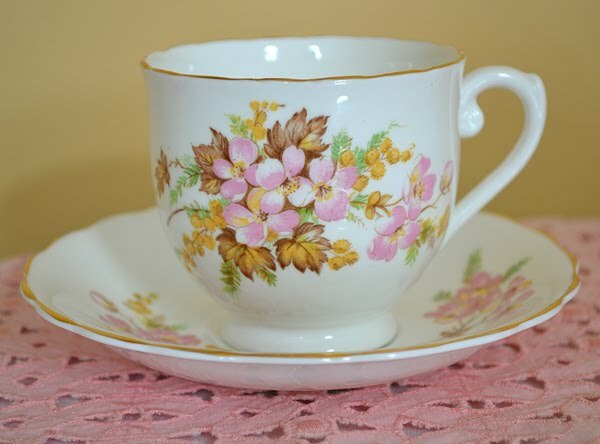 What a beautiful dainty cup..such a soft color palette too..so very sweet! Wishing you a fantastic day sweet friend.. Thanks for the lesson Terri....I just haven't figured this all out yet. I used to just pick up teacups because I liked the "look"...now I'm interested in the marks. I didn't know the little gold marks meant anything. Never too old to learn. Have a great week. Pretty cup and saucer. Is that made from England or China? This information is always very useful teacup collectors. This is what I am most interested in part, origin of fragment, manufacturers, period, in short, social history! And your cup this week is beautiful autumn released. The lack of manufacturer's mark, I think that sometimes, when they participate in setting, so only tableware, tea pot, sugar bowl, cream - will bear a mark. 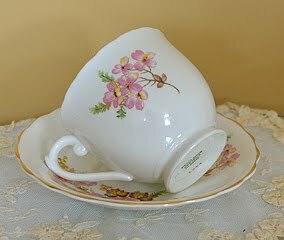 I just recently started collecting antique tea cups and happened to come across your blog. Your article caught my eye because I have a teacup with the exact same "backstamp" - same font, same colour, same arrangement, same everything. We do not have the same teacup - mine is a different pattern and my number mark is "17".